This panel painted by well-known artist Viktor Tretiakov shows the traditional theme of Russian Lacquer miniature. This tradition sprang from the very beginning of lacquer ware production in Russia when the first lacquer workshop was founded by Peter Korobov in the village of Danilkovo (now Fedoskino). At that time the theme of peasant everyday life was very popular among painters. 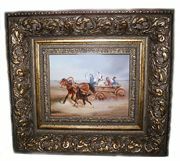 On this painting we can see a cart with peasant kids. The cart is pulling by a horse, the young cub is rushing near the horse.The young coachman whips the horse with the reins making it race faster. On the back of the composition we can see beautiful summer landscape and boundless Russian fields. The scene is painted in various shades of blue, brown and gray oils suitable for reproduction of a summer day. Details on a painting are amazing! The wall-hang/panel is constructed from paper-mache. The painting is signed by the artist.